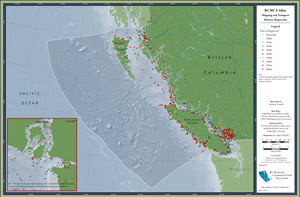 description — Locations of shipwrecks that have occurred since the early 1900s. I have viewed two shipwrecks in Trinity Bay, Malcolm Island at low tide as they are both together and accessible but have not found any record of them to date. These may be part of a future trail to view large trees and these two shipwrecks and would like to find information on them. Hi Gord! Sorry for the slow reply! How is life in Sointula these days? I had a look at the spatial data that we have and unfortunately it doesn’t show anything within Trinity Bay, only a wreck on the east side (off Donegal Head) and another south of Pulteney Point. 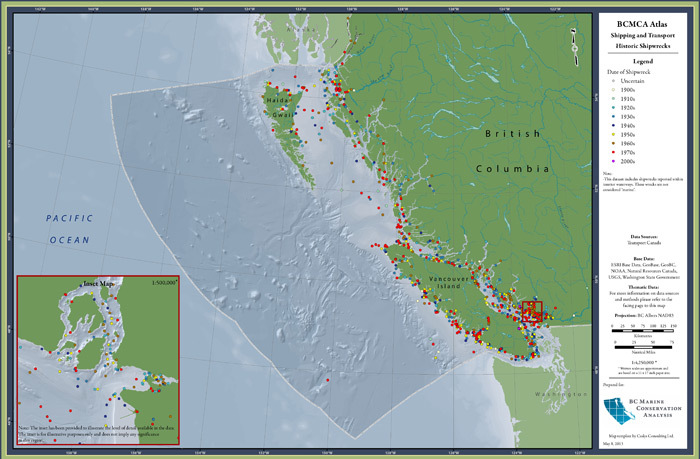 The BCMCA obtained the information on shipwrecks from Transport Canada (via Ryan Greville), so they might be able to tell you more. If not, they might be interested in getting the coordinate details from you to add to their database.